Will autoprune by default once it reaches the target pose. 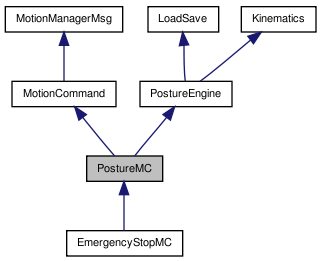 If you want to keep it alive so your behavior can repeatedly use the posture to move around, either call setAutoPrune(false), or (preferably) use MotionManager::addPersistentMotion() when adding the motion. This class will throw a status event when the sensors confirm the robot has reached a specified target posture, within a configurable range of tolerance. The class will keep trying to reach a target position for timeout milliseconds before giving up. By default, this class will adhere to the values of MaxOutputSpeed, except for head joints which use Config::motion_config values. Definition at line 28 of file PostureMC.h. Call this if you call PostureEngine::setOutputCmd(), or set values through getOutputCmd()'s reference, since neither will know to set the PostureMC dirty flag. Sets hold - if this is set to false, it will allow a persistent motion to behave the same as a pruned motion, without being pruned. Sets maxSpeeds to 0 (no maximum). Sets maxSpeeds to x% of the default MaxOutputSpeed values from the robot info file (e.g. CalliopeInfo.h). Sets maxSpeeds[i] entry, in rad/sec. Returns maxSpeeds[i] entry, in rad/sec. Performs inverse kinematics to solve for positioning Peff on link j as close as possible to Ptgt (base coordinates in homogenous form); if solution found, stores result in this posture and returns true. Performs inverse kinematics to solve for positioning Peff on link j as close as possible to Ptgt (base coordinates); if solution found, stores result in this posture and returns true. Performs inverse kinematics to solve for aligning the vector through Peff on link j and the link's origin to point at Ptgt (base coordinates in homogenous form); if solution found, stores result in this posture and returns true. Performs inverse kinematics to solve for aligning the vector through Peff on link j and the link's origin to point at Ptgt (base coordinates); if solution found, stores result in this posture and returns true. Definition at line 34 of file PostureMC.h. Definition at line 40 of file PostureMC.h. Definition at line 46 of file PostureMC.h. Definition at line 52 of file PostureMC.h. Definition at line 131 of file PostureMC.h. Neck joints are instead set from the applicable Config::motion_config values. Definition at line 18 of file PostureMC.cc. Referenced by EmergencyStopMC::EmergencyStopMC(), and init(). Definition at line 122 of file PostureMC.h. Definition at line 107 of file PostureMC.h. Definition at line 79 of file PostureMC.h. Definition at line 103 of file PostureMC.h. Definition at line 84 of file PostureMC.h. Definition at line 82 of file PostureMC.h. Definition at line 101 of file PostureMC.cc. Definition at line 83 of file PostureMC.cc. Definition at line 115 of file PostureMC.h. Definition at line 140 of file PostureMC.h. Definition at line 87 of file PostureMC.h. Definition at line 134 of file PostureMC.h. Definition at line 135 of file PostureMC.h. This is the downside of making setOutputCmd() not virtual - if you pass this around as just a PostureEngine, calls made to that won't be able to update the dirty flag automatically. However, if the object is typed as a PostureMC at the time the call is made, then you don't have to worry. otherwise you'd have to still check the motion out and it would make this all pointless! MotionManager::getOutputCmd() is called instead of WorldState::outputs because if this is being called rapidly (i.e. after every sensor reading) using the sensor values will cause problems with very slow acceleration due to sensor lag continually resetting the current position. Using the last value sent by the MotionManager fixes this. Definition at line 10 of file PostureMC.cc. Referenced by clear(), doStart(), init(), loadBuffer(), setAverage(), setCombine(), setOverlay(), setUnderlay(), setWeights(), solveLinkPosition(), solveLinkVector(), and takeSnapshot(). Definition at line 78 of file PostureMC.h. Definition at line 98 of file PostureMC.h. Definition at line 137 of file PostureMC.h. Definition at line 132 of file PostureMC.h. Definition at line 83 of file PostureMC.h. Definition at line 81 of file PostureMC.h. Definition at line 133 of file PostureMC.h. Definition at line 130 of file PostureMC.h. Definition at line 129 of file PostureMC.h. The difference between solveLinkPosition() and solveLinkVector() is typically small, but critical when you're trying to look at something -- the solution obtained by simplying trying to solve for the position may not align the vector with the target -- solveLinkVector() tries to ensure the vector is aligned with the target, even if that isn't the closest solution position-wise. Definition at line 146 of file PostureMC.h. Definition at line 143 of file PostureMC.h. this method is an approximation, could be more precise, and perhaps faster, although this is pretty good. Definition at line 151 of file PostureMC.h. Definition at line 148 of file PostureMC.h. Definition at line 128 of file PostureMC.h. Definition at line 127 of file PostureMC.h. Referenced by EmergencyStopMC::EmergencyStopMC(), and takeSnapshot(). Definition at line 46 of file PostureMC.cc. Definition at line 164 of file PostureMC.h. Referenced by EmergencyStopMC::freezeJoints(), getCurrentValue(), setDirty(), setOutputCmd(), updateOutputs(), and EmergencyStopMC::updateOutputs(). Definition at line 158 of file PostureMC.h. Referenced by EmergencyStopMC::freezeJoints(), isAlive(), isDirty(), EmergencyStopMC::releaseJoints(), setDirty(), setOutputCmd(), updateOutputs(), and EmergencyStopMC::updateOutputs(). Definition at line 159 of file PostureMC.h. Referenced by getHold(), isAlive(), setHold(), and updateOutputs(). Definition at line 165 of file PostureMC.h. Referenced by defaultMaxSpeed(), getMaxSpeed(), noMaxSpeed(), setMaxSpeed(), and updateOutputs(). Definition at line 161 of file PostureMC.h. Definition at line 162 of file PostureMC.h. Referenced by isAlive(), and updateOutputs(). Definition at line 163 of file PostureMC.h. Referenced by getTimeout(), isAlive(), and setTimeout(). Definition at line 160 of file PostureMC.h. Referenced by getTolerance(), isAlive(), and setTolerance().